what will be the fate of this new edition. Max Stirner was (aside from the somewhat psychotic Marquis de Sade) the only political-ethical thinker in all history who deliberately rejected all forms of authority over the individual. Since he was a German, living in the Age of Hegel, he saw fit to express this ultra-individualistic position in an exhaustive (and exhausting) book. The Ego and His Own starts out by giving the Church the worst drubbing it has had since Voltaire and Tom Paine; but that is only the beginning. Stirner then proceeds to tear down the idealism of the State, monarchistic or democratic, and then in turn demolishes the various forms of liberalism, socialism and radicalism. 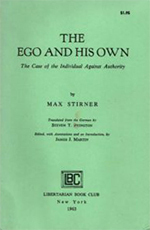 All that remains undemolished by Stirner’s destructive logic is—the Ego and his own. If you are an individualist, or think you are, you should read Stirner to find out if you are willing to carry self-assertion as far as he. (You probably will draw the line long before he does.) If you are not an individualist, beware—this book will give you high blood pressure. A final word of warning: Ayn Rand disciples will not like Stirner, who ends up his book as a socialist, albeit a peculiarly egotistic socialist. (No socialist party around today would accept Stirner, except the anarchists, and even most of them reject him.) Who will like this book? The man who has the guts to think for himself and who refuses to bow to any authority except his own independent judgement. reviewed by Robert Anton Wilson appeared in Jaguar, Volume 1, Issue 6 in November 1965.